Lake Cle Elum Vacation Rental #9404 LakeHouseVacations.com Rent Me! Aspen Lodge! Newer Cabin on 5 Acres! 6BR 3.5BA, Sleeps 20, Hot Tub! Deer Creek Lodge! Summer Pool Hot Tub Snowmobile Paradise! Upscale Vacation Home Near Suncadia! Summer Pool Hot Tub FREE NIGHTS! Newly constructed custom cabin in desirable Evergreen Valley! Fantastic outdoor living space with 500 sq ft of covered decks, a large patio, 9 person hot tub, fire pit, and a beautiful lawn. This spacious rambler boasts a large central great room, 4 Bedrooms, 2.5 Baths, and a fun family game room in the heated garage. This pet friendly cabin comes with AC, WiFi Internet, 6 Flatscreen TVs, DVD Players, and DirecTV. The Great Room is a fantastic place to sit back and relax while enjoying your favorite movie or show on the large flat screen smart TV with surround sound. The room is accented by a floor to ceiling ledge stone gas fireplace. The large outdoor entertainment area is just off the great room through the double doors. The deck features comfortable outdoor furniture and a gas BBQ. Just a few feet off the deck is the 9 Person Hot Tub and built in fire pit for making s’mores with the kids! While the adults relax in the great room the kids will enjoy hours of fun in the heated, garage game room. The game room features a large leather sectional, flat screen smart TV, DVD, air hockey, and ping pong! Just a short 1.5 mile drive and you’ll be at the shores of Lake Cle Elum on Speelyi Beach! The lake offers all types of summer time activities, including swimming, boating, waterskiing, jet skiing, and paddle boarding. This cabin also comes with access to the Roslyn Ridge Activity Center! This new facility just one mile from the cabin boasts a large outdoor Pool, Hot Tub, Tennis Court, Basketball Court, Sand Volleyball, Shower/Locker Room Facilities, and more!! Winter is also a great time to visit and enjoy the snow! Cross country ski, or ride snowmobiles directly from the cabin to over 100 miles of scenic, back-country trails! The large, granite kitchen features stainless appliances and a 16ft eating bar with 5 Bar Stools. The kitchen is fully stocked with all the utensils, pots, and pans to make fabulous in home meals. Just off the Kitchen is the dining area with seating for 8. The Bedrooms are well appointed with flat screen smart TVs, and comfortable mattresses. The Master features a King Bed and a spa like master bath equipped with a 2 person soaking tub and a dual head shower. The 3 Guest Bedrooms are furnished with 2 Queen Beds and a Twin over a Full Bunk Bed. The guest bedrooms are supported by a full bathroom with a tub/shower combo, and a powder room. There is a $50 to $100 cancellation fee for reservations canceled with more than a 60 day notice before your scheduled arrival date (90 days for reservations made during Holiday periods). If you cancel your reservation with less than a 60 day notice (90 day notice for Holiday periods) your payments are non-refundable, but you have up to a year to re-book the same cabin during one of our designated Off-Seasons for a 20% re-booking fee. This ad has been viewed 1836 times. We had 8 adults stay here and it was perfect! We went to the Suncadia Resort for a day trip (three of the ladies hiked the 3 miles there.) We enjoyed the open floor plan so we could all visit without being away from each other. It was the perfect winter weekend getaway. Only con: the wood floors are a bit loud, I think they are warped from people coming in and out of the house with wet shoes? " We had a wonderful family Christmas at Tamarack Lodge. My husband brought his guitar and I brought my ukulele and we sang Christmas carols, went sledding, walking in the snow, did a puzzle, played ping pong, played air hockey and watched It's a Wonderful Life! We had a great vacation! The only things that were not great is that the hot tub cover was very heavy so we couldn't even take it off. We had to just use half with only 3-4 people in it. Also, the floors are very hard,cold and noisy and most of us did not bring slippers. We definitely should all have had slippers. It would have been not so bad in the summer. We did have a great time and loved the game room/garage for playing games. " This was our first family getaway since both of our children got married. The 6 of us had the best time and would like to make it an every other year trip! We loved the Tamarack Lodge also!" Tamarack Lodge was perfect for our family vacation! The kitchen was well stocked and the layout is great for families. Between the game room, hot tub, nearby lake, bike trails and swimming pool there were activities for everyone. And All Vacations Rentals is an excellent company for work with. " Tamarack Lodge was perfect for us, It was one story, with few stairs. The outdoor area was perfect for visiting and eating out. It faces mostly North so very little direct sun. The kitchen is stocked well, appliances are all very nice. Well layed out to feed large group. There was at least 2 or 3 of us in kitchen and we had plenty of space. All Seasons was great to work with. We’ve rented many properties and this was our favorite. Hoping to stay here next time. The 20 somethings enjoyed their evenings playing ping pong and the hot tub. It was in the 90’s all 3 days we were there so thankful for a/c and the fan in the living room." "Quiet and relaxing-great for family getaway! Loved staying at the lodge-it has all the comforts of home in a convenient rambler wth a perfect private backyard for a little bean bag toss or frisbee. Four bedrooms allowed my sister and her family and my dad to join in for a birthday party with elbow room! Would definitely stay again!" We really enjoyed our stay at Tamarack. The house was as described and then some! Easily housed 6 adults, 5 children under 3, and a small dog :) We loved having access to the Roslyn activity center, which is a great pool for the kids. Also nice being close enough to the town center to get groceries and also to Suncadia, so we could check out the winery and playgrounds. The only drawback was the long list of house rules - made us feel somewhat unwelcome and on edge that we would be charged for any little thing out of place. Would have been nice to know that the kitchen basically only has salt - bring your own olive oil, pepper. Otherwise the house was great - loved all the amenities (Smart TV, ping pong table, my daughter loved the stuffed moose!). Would definitely rent again :)"
"Great place to relax as a family! Our two families had a great time over Memorial Day weekend. 3 kids, 4 adults - plenty of room and fun things to do for all. The game room was awesome, the yard was flat and beautiful and tons of room to play. The hot tub was a hit with everyone. We couldn't have picked a better place to stay! The house was super clean and had everything we needed. Thanks so much!" "Fun ammenities and great location! Tamarack lodge is a well appointed, spacious home in the Roslyn/Ronald area. It's a couple blocks from a greenbelt near the river so it's easy to hike or run right out of the front door. The outdoor living space, over-sized hot tub, and fire pit were all extra special touches. We would love to go back! The rental staff was also very communicative and easy to work with." Overall I, and the entire group, was very happy with the stay. However, I do have a single complaint. Upon arrival we discovered that the hot tub was not anywhere close to a usable temperature. This was especially frustrating since one of the main reasons for selection of this rental was the fact that there was a hot tub. We stayed two nights and were not able to use the hot tub the first night. It did get up to temperature overnight so our second night we were able to use it during our stay. Again, this is a single complaint and overall everything else in the rental was great. I'll recommend it to friends and plan on trying to stay again next year." Upon arriving our whole crew was amazed at how beautiful the cabin itself was! Nice furniture and an open lay out. The game room and sound system were a big hit and we loved being able to enjoy the snowfall from the hot tub! You'll definitely never be bored staying here, between the collection of games at the lodge itself and the recreation nearby. We opted to rent snowmobiles and enjoyed an entire day exploring the trails. Overall on of the best vacation experiences we've had!" My friend and I took our kids for a fun time playing in the snow. We were not disappointed and felt this place exceeded our expectations. From the well equipped kitchen to the comfy living room by the fireplace. We got rubbed and enjoyed roasting marshmallows by the fire pit. The house was beautifully decorated and felt comfortable with room to spread out. Will be back!" 4 bedroom with a jacuzzi. Also the garage was turned into a game room with ping pong and air hockey"
The rental home was perfect. The kitchen was well equipped, the location as great, the game room was a bonus. We fished the Yakima on a very cold day and the hot tub was a special treat when we got back. We would definitely book this again!" We stayed here for a weekend with a group of friends and the experience was amazing. Well maintained and equipped, the tub was great fun!" 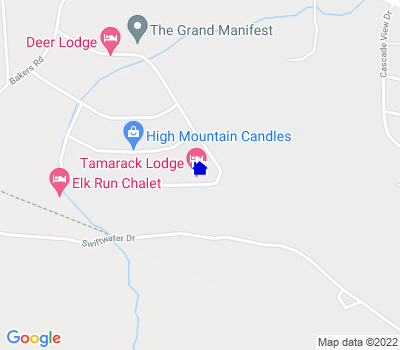 We went to the Tamarack Lodge for my partner's 40th birthday. It's a gorgeous space with a lot of character. From the ping pong table in the garage to the spacious gaming/dining table, from the charming covered deck to the dual head master shower, this place has it all. The only issue that we had was that the hot tub was a bit grimy when we arrived but after one of my fellow guests cleaned it, it was a treat. " Our group of 8 adults enjoyed this home comfortably for a long weekend. It is a beautiful, well appointed house, wonderful big deck, large hot tub, and relatively private yard. There was even a welcome basket for our dog! We had a fantastic time! " We had a great time at Tamarack Lodge. The booking and access was super easy and the management was very pleasant to deal with. We had a group of about 8 stay for a few nights and the home was plenty big, even if there were a few more guests. We really loved spending time on the outside patio, and we have the hot tub plenty of use. One bonus, the wifi was great but cell reception was really strong at the house. I've stayed around the area before and didn't have reception, so that was a bonus. If I were to find anything to complain about, it would only be that the hardwood floors were a bit loud/squeeky. But that wouldn't stop me from wanted to stay there again. In fact, our whole group said the same thing, and we all wished we could have stayed there longer." Our group of old ladies had a wonderful time. We Loved the house. It was perfect for us with lots of space. Love the two big tables inside and out so we could do our crafts outside and keep them up the entire time with out having to take them down for dinner. We used the hot tube, fire pit, and outdoor space. We had a few issues working the TV but other than that loved, loved ,loved it. One suggestion: sugar for coffee. We did not think to bring sugar. Thanks so much for making it easy to rent. We will consider this option again." This house is beautiful and impeccably decorated! We truly enjoyed every minute we had there! Everything was comfortable and clean and so relaxing! We will be back! The little town of Roslyn is perfect for exploring and eating. :) "
Awesome new house with a wonderful layout for a family of four couples and three dogs? Plenty of space for all on the comfy sofa to watch all of the Star Wars movies, good puzzle table, a quiet library corner and a game room! Added bonus this year...SNOW. Good area for snowshoeing and snowmobiling. House was sparkling clean and the hot tub was glorious in the snow. Everything was dialed in for us from arrival to departure. Great house in a great community. " We had a wonderful annual girl's weekend at Tamarack Lodge in the midst of incredible fall colors. Every aspect of arranging the trip was a breeze and All Seasons is great to work with. The home was clean and well stocked with dishes, glassware and pots and pans. Appliances are awesome. The house if very private and the layout is wonderful for a family or group with an open design (kitchen open to great room) and there is a fabulous game room in the garage for kids. The couch in the great room is super comfortable and will fit a crowd. The hot tub was clean and ready to go, and the covered back patio was nice for morning coffee during the rain. We loved the fire pit for our evening fires. There is a great set up for music, TV or movies with clear instructions on how to use. The only negative feedback we'd give for the house is the floors are incredibly noisy (almost comically noisy) so this house may not be for you if you have light sleepers or small children who nap as you'd be unable to move once they were asleep. Also, the great room is not well lit so it's hard to use the perfect puzzle table for anything beyond a foot rest....we'd also suggest they add night stands and lamps to both bed sides of the smaller bedrooms for reading at night. They also need to add a light to the shower area in the smaller bathroom as it's very dark once the shower curtain is closed- maybe fine for bathing small kids in the bathtub with the curtain open but not ideal for adults showering. But all in all we had a wonderful time and enjoyed this home. We look forward to another stay next fall in the greater Lake Cle Elum area and we will use All Seasons rentals for sure!" We found the house to be very comfortable. Loved the big covered deck! The only big negative was the noise floors. I guess the good news is, no one could sneak up on you." The house was beautiful. The setting was very peaceful and quiet. A short walk to hiking trails, fishing, and fantastic views. The experience was A plus. Thank you so much for your hospitability. " Very enjoyable stay here for all of us. Lovely backyard patio and lawn for play and relaxing. The kitchen/equipment was well stocked for large meals. And the house was very clean and spacious. " We had a wonderful time on this trip. The house was perfect and the decor was very nice. It was clean & well stocked. The hot tub & game room were a big hit with our family. We would definately like to visit again next summer. Thanks for sharing your home with us ??" The house was great, super quiet neighborhood, house was stocked with everything we needed. I would like to mention getting a better BBQ. The one provided is too small for any groups larger than 2 people. We ended up not using the BBQ due to this and ended up having to/feeling like we needed to, change the menu after arriving. Fairly disappointing to be honest." Beautiful new house on one level which was perfect for small kids. They even had extra pack n plays along with a high chair which came in handy. It was a great place to play in the snow - simply walk out into the backyard. The covered back porch was great, so was the hot tub. It had everything we could possibly need. The only downside was that the floors were incredibly creaky for such a brand new home. It was only a factor as we had a baby in the room with us. The property management folks were very communicative and made the check in/check out process very smooth. We would stay here again in a heartbeat." The house is very nice and new with high end appliances, electronics and fixtures. We have stayed in plenty of places with outdated appliances and electronics and it was refreshing to have this place for a change. The covered deck was quite nice in the winter for grilling and I am sure will be nice in the summer to stay out of the heat. We would definitely stay here again. " This house was suggested to us as we were calling to try and find somewhere to reserve. I looked at the pictures and thought we have to get this house. Splitting it between everyone too it came out to be very affordable! Spacious house with more than even sleeping areas for everyone. As a girls weekend the 2.5 bathrooms definitely helped as well. Spent a lot of our time in living room on a very comfortable couch playing games or in the garage, which is done fully as a game room with ping pong table and air hockey. It was fun to just open the garage door and hang out. Large beautiful well-maintained house that I definitely plan to get everyone together again and reserve. It couldn't have been more convenient or a wonderful stay. Before and post stay too the team does a great job of making sure you're prepared by sending emails up to your stay, reminder emails of what to do when you leave and after your stay. Made things sooo easy! Also, was very nice to have the surround sound setup for music the whole time, central air and wifi. Gotta love those modern conveniences. :) "
The Tamarack Lodge is a wonderful cabin - large, new, great location and well equipped. We were a group of 3 families and had room to spare. We enjoyed playing in the snow, sledding, feeling remote but being close to town, air hockey, the large dining room table and the amenities inside the cabin. You will not regret choosing the Tamarack Lodge! One suggestion - a coat rack by the sliding door. Our kids would come in from playing in the snow out back and did not have a place to hang their gear. It would be nice to hang them there - and by the fireplace - to dry." We had a wonderful time at Tamarack Lodge. Everything was great and so comfortable." Relaxing and full of fun. "